We've all experienced the needlessly big cardboard box from Amazon at least a couple of times. You order a small product that could've probably been put inside of a tiny package the size of a ring box, or even an envelope, but instead, it came in the next wing of your cat's ever-growing brown-paper palace. You might be wondering to yourself just how the world's most successful and recognized online retailing brand managed to mess up something so simple as shipping. Surely the mighty Amazon would know not to pack an SD card in a corrugated box that could fit a PS4 and an industrial-sized tub of lube. Not to mention all of that extra paper can't be good for the environment, can it? 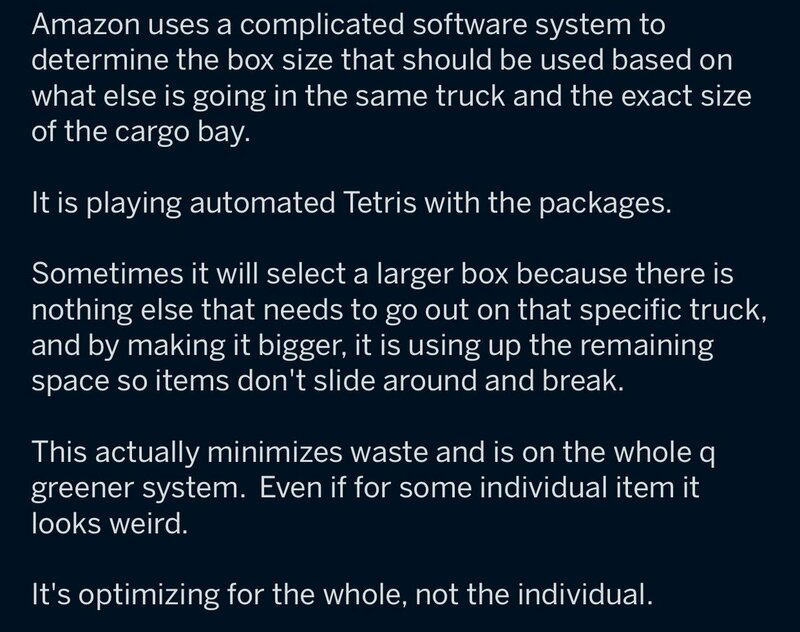 Well it turns out that actually, Amazon's putting small items in huge boxes because ... wait for it ... that's what the computers tell the packers to do. Not surprisingly, there's more to the story. This makes no sense. When packing a truck, the idea is to fill the cube as densely as possible. Pack more widgets on a truck and the cost to ship each widget goes down and it looks like others agree. No one would purposely leave space in a trailer to protect packages. That's what air pillows, bubble wrap, Kraft paper and other kinds of protective packaging is for. "Dude I've worked in warehouse unloading Amazon trailers and that is a load of baloney. If only I had a dollar for every time a mountain of packages almost fell on me opening the trailer doors." "I was a packer while there... The packing slip has the items and would have a letter code, A1 BO, K, AB, etc. These are the box sizes. You are told from day one to follow that code." According to an article in technologyreview.com, humans work in close collaboration with computer automation. Products flow through Amazon's warehouses at a dizzying pace. Orders are picked and sorted in to batches headed for a single customer. The computer knows the dimensions each product and will automatically allocate the right box. It even knows the right amount of packing tape. "Box size is determined by dimensions of the item, not how it’s going to be packed in the truck. When you get a giant box for a small item, it’s usually because someone [messed] up when they measured the item, e.g., they measured a pack of six instead of the individual item. Source: I write software that handles measurements at Amazon." This seems to be the most logical explanation. The computer specifies a box, it's incorrect, the packer knows it's incorrect but doesn't have the time or the ability to make a change. "So, seeing some seriously stupid box sizes come through, I would down size the box to make sense. The first time I got a passing "Hey SaebraK, make sure you use the box size on the invoice." The next time I got a real warning and told if it happened again I'd be written up." So now you know why that deck of cards came in a box the size of a big screen tv. Want to learn how to correctly size a box for your products? Our infographic will give you the roadmap.